The NBA recently announced its individual regular-season awards and there were very few, if any, surprises in the bunch. The thing that remains uncertain will be whether these awards will have any affect on card or memorabilia values going forward. 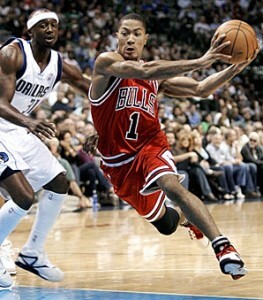 The Most Valuable Player (MVP) Award went to Derrick Rose of the Chicago Bulls. The youngest MVP in league history, Rose averaged 25 points and 7.7 assists per game while leading the Bulls to the best record in the NBA. In only his third season, Rose has brought the Bulls back to prominence and made himself a household name. Since arriving to the NBA in 2008-09, his cards have been steadily increasing in value. Although the MVP award was expected, it places him in the same conversation as the giants of the NBA - Kobe Bryant, Dwyane Wade, LeBron James. All that is needed now in his young career is an NBA Championship. If he can get that this year, his cards will skyrocket. The Most Improved Player (MIP) Award went to Kevin Love of the Minnesota Timberwolves. Love is another young player making good in the NBA. He averaged 20.2 points and a league-leading 15.2 rebounds per game, in addition to being named to his first All-Star Game (as an alternate). Love put to together a streak of 53 consecutive double-doubles and was only two short of tying Elvin Hayes' record of 55. Love has flown under the hobby radar until now, largely due to the fact that the T-Wolves have not won many games in recent years and are a small-market team. Now is a great time to get some of his rookie cards at a reasonable price before his free agency in the summer of 2012. He will either sign a huge deal with Minnesota along with the expectation that they will surround him with talent or he will move to a large-market team looking to make a deep playoff run. Either way, things are looking up for Love and his cards should continue to increase. The Defensive Player of the Year Award went to Dwight Howard of the Orlando Magic. Howard is the first to win it three consecutive seasons. Howard averaged 14.1 rebounds, 2.3 blocks and 1.3 steals per game and led the NBA in double-doubles for the season. Although he is only 25-years-old, this is his 7th season and his teams have still not lived up to expectations. This year the Magic did not make it out of the first round of the playoffs, losing to the Atlanta Hawks, a team they swept in the first round in the previous year. Howard has made it clear that he wants to compete for a championship and it is likely he will do so for another team once his contract is up. He is currently signed through the 2012-13 season, but has an early termination clause that could make the defensive standout a free agent as early as next summer. Dwight Howard is still a dominant force and an amazing basketball player. He will likely follow the Shaq model by leaving Orlando for a larger-market team and, ideally, winning championships there. Two teams mentioned regularly are the Lakers and Nets. Given his consistent output and strong play, his cards will continue to command a premium but if he does make the jump to a team with other stars in place, he could approach the value of the game's elite. It would also continue the recent pattern of "super-teams" in the NBA. The Sixth Man of the Year Award went to Lamar Odom of the Los Angeles Lakers. Odom averaged 14.4 points and 8.7 rebounds per game coming off the bench for the Lakers. He is an above-average player who does not hold a full-time starting position. Surrounded by some big names that tend to overshadow his accomplishments. However, his notoriety is helped by his marriage to celebrity/reality star, Khole Kardashian, as well as being on the high-profile Lakers. Odom is an older player, having just finished his 12th NBA season, so his best days may be behind him. At this point, he is a role player, which is why his card values will remain level unless he gets a starting job and can perform as he did earlier in his career with the Clippers.
. Eventually, the question is how much higher can they go? As long as he stays healthy and can continue improving, there is no reason that he cannot be a part of the young group of players that will drive basketball collecting for the next 10-15 years. 2013-14 PANINI PRESTIGE BASKETBALL - STARS, ROOKIE RC'S - WHO DO YOU NEED!! !